Nearly two years ago, I started this blog series to describe the main challenges I’d experienced trying to implement Continuous Delivery. At the time, the last post in the series was about four challenges related to people. Since then I’ve observed a fifth challenge and discovered it has been studied in psychology and has a name. In this post I’ll attempt to describe how to recognise and tackle Learned Helplessness. Please share your comments (especially if my Psychology-by-Wikipedia needs guidance). Something is done (or not done) on an engagement that makes Continuous Delivery difficult (for example the development team accepting SonarQube saying some seriously defamatory things about their unit test coverage but neglecting even to gradually address this). many people already appreciate that this is very wrong. hardly anyone can really explain or justify why this is happening. hardly anyone seems worked up about a solution. Joined the engagement, didn’t understand why certain things were / weren’t done, but opted to observe before speaking up. Realised things actually weren’t magically working in some new logic- / experience- defying way. Spoke up but didn’t really get listened to. Spoke up again several times , but didn’t really ever get listened to. Gave up and accepted things for the sorry way that they are. some dogs received shocks at the same time as group 2 dogs but had no button. Group 3 dogs were paired with Group 2 dogs and were shocked until their Group 2 pair happened to press the button (which was at a random time from the Group 3 dog’s perspective). 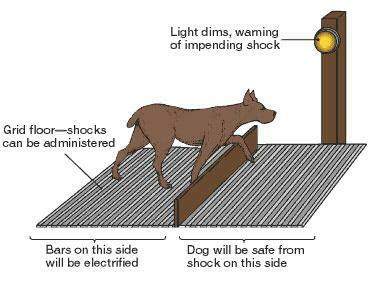 The learned helplessness of Group 3 was demonstrated in the second part of the experiments when dogs had the opportunity to cross over a small wall to avoid getting shocks. Whereas groups 1 and 2 quickly learned how to avoid shocks, group 3 all failed to learn and sat their accepting their fate in pain. The similarity of the above diagram to diagrams about DevOps like this made me smile! Subsequent experiments demonstrated the ineffectiveness of threats or even rewards on motivating group 3 to change their location. Only by physically teaching the group 3 dogs to move more than twice did they learn to overcome the helplessness. Later experiments also proved the same phenomena in humans (without electricity). Try some introspection – ask yourself what you’ve learnt to accept, really look around for things that are stopping your project going faster – no matter how obvious, and start to ask why, perhaps at least 5 times. Ask others around you ideally at all levels of experience less, the same and more than you what they think is preventing learning and improvement and consider asking “5 Whys” with them. Pay close attention to new joiners to your team – they are the only ones not yet infected by Learned Helplessness. Be sensitive with people. No-one wants to be told they are “helpless” or hear your amateur psychobabble. Tread carefully. That the proposed change is possible. You need to demonstrate it to them (for example if it relates to Continuous Delivery something like the DevOps Platform may help make things real). That their opinions count and they have an important voice. How is Learned Helplessness harming your organisation and to what extent are you suffering?